The STA hosted the popular Swim Zone for the second year running at this year’s LIW. The traditional curtain raiser to the exhibition season, Leisure Industry Week celebrated its 25th anniversary this year and promised to be bigger and better than ever before. It was more a case of quality over quantity in terms of attendees, but none-the-less, with 215 exhibitors spanning across six core leisure sectors including Pool & Spa, Play, Health & Fitness, Food & Drink, Leisure Facilities and Sport, there was still plenty to inspire and invigorate. There were about 25 exhibitors within the Pool & Spa section who were rewarded for their investment with enquirers from sectors such as holiday parks, swim schools, leisure centres and hotel chains. New for this year, the Pool & Spa Advice Clinic, hosted by Pool & Spa Scene magazine, provided a central hub for visitors to discuss their pool and spa requirements with a panel of leading industry experts. Co-ordinated and staffed by Pool & Spa Scene magazine team, the clinic welcomed representatives from Bayrol, Anapos, DG Pool & Leisure and the Pollet Pool Group, covering all aspects of pool and spa design, construction and maintenance. The advice clinic was well-received by both exhibitors and attendees, with many remarking on the positive and fresh approach that it bought to the annual exhibition. Glyn Lucas of DG Pool & Leisure said: “The Pool & Spa Advice Clinic was a roaring success and we would most certainly look to be involved again next year. Representatives from all sectors of the leisure industry flocked to the NEC in September for the Leisure Industry Week. “We were glad to see a variety of visitors at the show, with a good mix of both domestic and commercial pool owners. 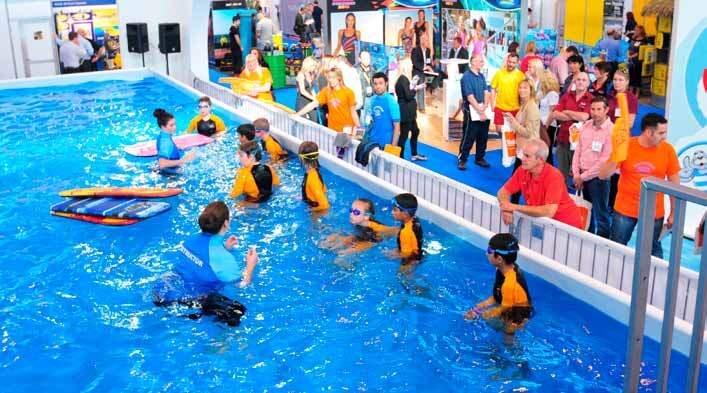 Elsewhere in the exhibition hall the STA hosted the Swim Zone for the second year running, and this time the pool was a central feature on the show floor, allowing demonstrations to get more exposure. This included a synchronised swimming display from Zoe Cooper, former British Champion and star of Britain’s Got Talent, plus a special one-off performance from a real life mermaid. The STA also used the show as platform to launch their new Photometer, a digital technology allowing real time analysis, alerts and reporting live in the swimming pool. For more on this story, please subscribe online today.